New adventures! 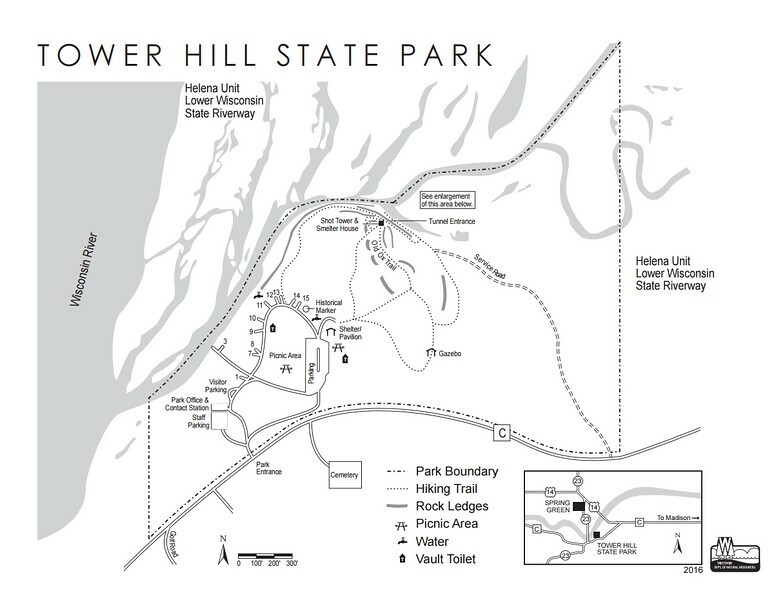 'Tis a little gem of our state park system, Tower Hill is. So you guys, I've been so intrigued by this park and been wanting to check it out for a really long time. Now I have! Outside the town of Spring Green and located along the banks of the Wisconsin River is seventy-seven acre Tower Hill State Park. You drive through Frank Lloyd Wright country, passing many of his architectural masterpieces like Taliesin. I was crazy excited because today I finally got to explore it as it's been on my adventure bucket list. Similar to my fascination for National Park Service properties that showcase important pieces of history, Tower Hill does the same for Wisco history by means of a preserved shot tower and melting house where lead shot was made in the mid-1800s. While Tower Hill is open 365-days a year, the main gate is closed during off-season (Columbus Day to mid-May), so you'll need to park by the park office and walk down the road a minute or so to enter. Once you're in the park, you'll make your way through the small campground with the majority of its sites along a clear creek or the bluffs above. There are eleven basic, non-electric, non-reservable sites and a pit toilet. I'm super stoked to return here come summer time and camp out, being a big advocate of smaller, rustic campgrounds rather than ones littered with massive RVs sucking-up electricity. Campsite 3 is nestled on the Mill Creek, which is perfect for launching a canoe or kayak just feet from waking up in your tent. Warm temperatures cued for dreams of paddling up and down the creek and then connecting onward to the Wisconsin, stopping at all the sand bars with a Lenienkugel Summer Shandy in hand. When you get past site 13, you'll see the trail the starts taking you up the hill towards the shot tower and smelter house. It takes about fifteen minutes to reach the base of the super-cool 60ft wooden shot tower, in which you continue climbing some steep steps towards the smeltering house above. Don't forget to look out to your left too! The panoramic views are breathtaking. Lead mining was huge here during the 1800s. A lead miner from Galena, IL named Thomas Bolton Shaunce with the assistance of Malcom Smith started digging a 90-ft long tunnel from the riverbank's finishing house, into the hillside to 120ft-deep shaft that rose upwards through the sandstone cliff. Construction halted in 1832 when the nearby Black Hawk War came about and Shaunce and Smith joined the fight. After the battles, the sixty-foot wooden shot tower, visible today was complete, making the total shaft length a whopping 180ft deep. 75-lb bars of lead from Galena and Mineral Point were brought to the top smeltering house to be melted. Then, the melted lead was filtered through a ladle with holes in it. The hot, melted droplets of lead chilled tremendously as they dropped some 180ft down the shaft in the side of the sandstone cliff to a pool of water below. Workers would then remove the lead from the pool and draft them through the 90-ft horizontal access tunnel to the finishing house, where they'd be prepped and put on boats to be shipped east. When production was in full-kick, some 5,000 pounds of lead were dropped through the tower resulting in only about 800 pounds at most, being usable. The unsuitable rest of the lead, was then hauled back up to the top of the hill, melted again and thrown down the tower once more. Just incredible history here. Make sure to read all the complete history about the process here. When we reached the top, I lit my backpacking stove, brewed up some water for two mugs of tea and soaked-in the jaw-dropping views. It was so, so, quiet. A peaceful break from the daily grind. We continued on down the Old Ox Trail towards the base of the hill, where the trail carves alongside the creek to the access tunnel. I rubbed my hand along the porous, vibrant sandstone cliffs as we approached the start of the tunnel which like mentioned above, extends some 90ft back into the rock. A bat hanging from the ceiling was our indicator to turn around as it was becoming pitch black. Neither one of us felt like getting rabies from a napping bat's bite. We followed the fairly challenging, winding trail back up the bluffs towards the park entrance. I kept gawking at just how cool it was to see the restored shot tower protruding from the rock and the amazing scenery off on the horizon. For years I've declared the Driftless Area to be my favorite part of Wisconsin and places like Tower Hill only prove it to be more and more true. So load up your car, pack a lunch and go travel west to check out this hidden gem of a state park. While you're at it- get lost at the trippy 'House On The Rock' a few minutes away.